The beautifully restored Temple Gallery still retains many of the features it bore when it was a Masonic Temple. 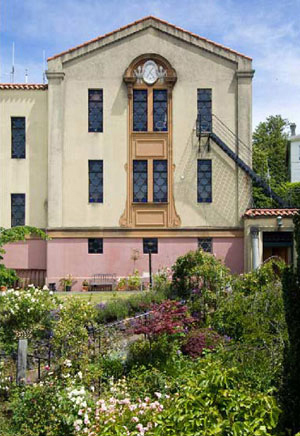 For 111 years the home of Lodge St. Patrick, the original 'Masonic Temple', is now called Temple Gallery, and houses a leading dealer art gallery and apartment complex within the impressive historic building. Situated in the heart of Dunedin at 29 Moray Place, the Temple started its life in 1864 as a Jewish synagogue, the southernmost in the world - it is now the oldest such building in New Zealand. A Masonic Hall from 1881 to 1992, and the meeting place of several Dunedin Lodges, it was the largest Freemasons’ Temple in southern New Zealand. In 1992 the building was acquired by Peter Duncan and Victoria Timpany, and, with due reverence and thoughtfulness, they have retro-fitted it as apartments and a fine art dealer gallery. In its long history there have been changes and additions but the building’s main historical features remain clearly legible, the synagogue’s sanctuary being not greatly changed by the Masons, whose ceremonies and symbols have connections with those of Judaism. The extensions built by the Freemasons feature stained glass windows with hexagrams, or Stars of David, set like jewels in their metalwork frames. The inner sanctuary retains the impressive Jewish Ark or Hekhál, though redecorated with ideograms of the Freemasons’ ‘Craft’, such as the All-seeing Eye. Following the discovery of gold in Otago in 1861, Dunedin’s small Jewish community expanded rapidly. It included able and enterprising people such as Sir Julius Vogel (1835-1899), founder of the Otago Daily Times, a Provincial Superintendent of Otago, and later the Prime Minister of New Zealand. As the community grew it was decided that a substantial place of worship was needed and the 1864 synagogue was the result. When it opened it was a tabernacle of English-bond brickwork, set on very high bluestone foundations, designed by William Henry Clayton (1823-1877). Julius Vogel may have had more on his mind than architecture because, in 1867, Clayton became Vogel’s father-in-law. The first stage of the synagogue cost about £1,400, a substantial sum in 1864. During 1869, when Vogel was in government, Clayton applied for the newly created post of ‘Colonial Architect’ and was immediately appointed. Apart from the synagogue, Clayton is remembered in Dunedin for the stunning All Saints Church on Cumberland Street, and the old Port Chalmers Post Office - now the Maritime Museum. It was always intended to extend the building towards the street and, in 1872 in anticipation; David Ross (1827-1908) was commissioned to design the impressive stone walls and ascending steps, to provide an appropriate setting. But the congregation continued to increase and it was decided to build a much larger synagogue a little further up Moray Place. As a result, the original building was sold to the Freemasons, who also commissioned David Ross, a Freemason himself, to expand and refit the structure. At a cost of £1,400, he built it upward and also forward towards the street. Among many other buildings, Ross is remembered for creating his grand house ‘Fernhill’ (now called The Dunedin Club), for pioneer Dunedin settler, farmer and shipping magnate, John ‘Johnny’ Jones (1808-1869). 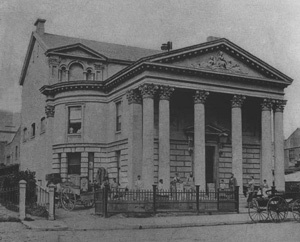 Pictured here in 1901, the Masonic Hall in Moray Place, Dunedin was home to Lodge St. Patrick for 111 years. In the Thirties, as now, it was considered quite a privilege to become a Freemason, and the Masons felt the need to expand too so, for a cost of £3,611, in 1932 they built a new wing to the south to accommodate a refectory, or supper room, and re-dressed the whole street frontage. Eric Miller (1896-1948) was their architect (although it is rumoured an itinerant Italian designer was also involved), the result was substantially the complex one sees today with its Romanesque street façade, featuring prominent decorative plasterwork and the metal framed stained-glass windows. Since Peter Duncan and Victoria Timpany acquired the building, apartments have been installed on the first and second floors, and a dealer gallery established utilising the Masonic refectory as the main exhibition space. Very appropriately they called the enterprise the ‘Temple’ Gallery.